Transition Year Graduation Evening on Monday, 31st May was a great success. Supervised Study continues prior to and during the Leaving & Junior Certificate Examinations. House Examinations are completed on Friday, 4th June. Best wishes to all our students taking Junior & Leaving Certificate. The Graduation Mass was celebrated in St. Peter & Paul’s church followed by a reception in the school. Thanks to the Parents Association for hosting the reception. Best wishes to all students taking house examinations. 5th and 6th Year Prizegiving is on Monday, 24th May. All other year groups finish class at 12.30 p.m.
Sixth Year students are preparing for Prizegiving on Monday 24th and their Graduation Mass on Tuesday, 25th May. Congratulations to Susan Byrne, Transition Year, who won the news reporter category in the Mock Trial Competition last Saturday. The team did extremely well and just missed out on qualifying for the final. Well done to the tennis teams on their matches this week. 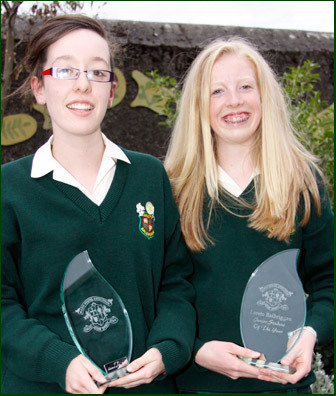 Head Girl: Grainne Rice, Deputy Head Senior School: Niamh Rooney, Deputy Head Junior School: Lisa McConnell (below). First Year Co-Ordinators: Roisin Leneghan, Kate O’Sullivan. Second Year Co-Ordinators: Lora Gilbert, Emily O’Regan. Captains: Anti-Bullying: Ann McNally, Art: Naomi Phillips, Gemma Thorne, Genevieve Kiely, Debating: Alexa Donnelly, Niamh Harford, Drama/Dance: Imogen Jenkinson, Michelle McCormack, Irish: Emma Gilroy, Languages: Maria Tibbs, Carlotta Morgan, Eleanor Foley, Orlaith Moore, Geography: Natalie Duda, History: Jessica Reilly, Ciara Delaney, Science: Kate Richardson, Sports: Orla Haran, Caoimhe Hughes, Sheena Carroll, Twinning: Elaine Haran, Environment: Andrea Sheridan, Religion: Patricia Farrell, Music: Aine Carroll, Lindsay Pulsford, Aoife Duff. • Monday, 24th May 2010; Senior Prize giving. Class for all year groups finishes at 12.30 p.m.
• Tuesday, 25th May 2010; Sixth Year Graduation Mass. • Wednesday, 26th May 2010; Junior Prizegiving. Class finishes at 12.30 p.m.
• Monday, 31st May 2010; Transition Year Graduation Evening at 7.30 p.m. Apologies for any inconvenience caused and best wishes for the months ahead. Congratulations to the U. 18 team and their coach, Mr. O’Brien, on winning the Leinster, Division 1, Schoolgirls Cup. The school now has Leinster trophies in both soccer and Gaelic. The T.Y. mini companies presented a display of their excellent work during the week. Best wishes to the Transition Year Mock Trial team at their Mock Trial final on Saturday, 15th May in the Four Courts. Well done to Gaisce students who completed the outdoor activity at the weekend with a walk to Carlingford. Thank you to all the teachers involved. Transition Year Assessment Interviews continued this week. Students presented aspects of their work to the T.Y. team. Leaving Certificate Art Practicals occurred on Tuesday and Wednesday. Well done to the students involved. Congratulations to our new Head Girl & Deputy Head Girls for 2010-11. 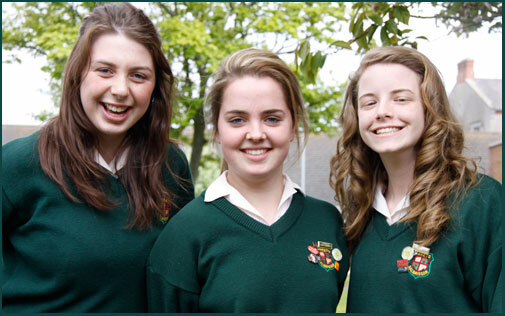 They are Grainne Rice, Head Girl, Lisa McConnell, Deputy Head, Niamh Rooney, Deputy Head. Other student leadership positions will be announced in the near future. Congratulations to the students involved in the 'One Good Idea' competition in Dublin Castle on Thursday, 6th May. The girls were 1 of 20 teams who qualified for the final, out of 150 entries and 1 of the 9 teams to win a major prize. They are Emma Cooke, Ciara Dunne, Lauren Fagan, Sarah Ferguson, Grainne Kane & Aisling McGloughlin. The girls won the Leinster photography part of the competition. The Senior Choir participated in the Navan Feis on Friday,7th May. Transition Year Irish students are participating in an Irish Drama workshop this week. Well done to both Junior & Senior tennis teams on their matches this week. The practical Art section of the Junior Certificate is on Friday, 7th May. The Leaving Cert practical is on the 10th & 11th May. First Years had a Sports afternoon on Wednesday 5th This was organised most successfully by the T.Y. Gaisce group. The Fifth Year Art classes exhibition was in the school on Tuesday, 4th May. 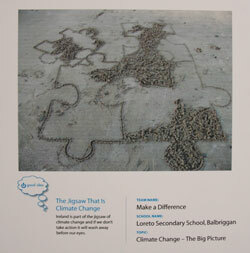 The exhibition was inspired by a visit to IMMA and the theme of change. Also on view was the Transition Year Photography groups' stunning photography. Well done to the U.18 Futsal team who participated in the Dublin Futsal tournament. The U. 16 soccer team are playing in the Senior Semi Final on Friday, 7th May. Well done to Roisin Leahy who ran an excellent 1500 metres at the North Leinster Athletics on Wednesday. The Power of One team comprising Emma Cooke, Ciara Dunne, Lauren Fagan, Sarah Ferguson, Grainne Kane and Aisling McGloughlin are busy preparing for the finals in Dublin Castle next week. Well done to Transition Year Mock Trial group who have also reached the finals in the Four Courts. Basketball, soccer, futsal and tennis teams participated in matches this week. The U-18 Futsal group won their competition. All First Years have been visiting Monasterboice‎ and Newgrange this week. 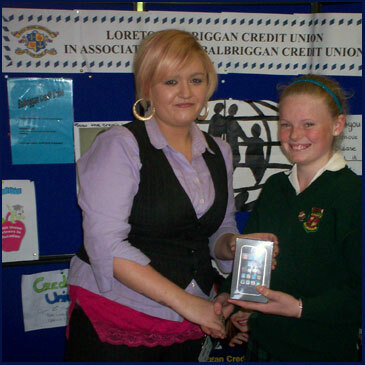 Well done to Cliona Farrell, 1A, on winning a brand new iphone in the Loreto Balbriggan Credit Union Easter promotion. Cliona receives her iphone from Ciara Branagan, Balbriggan CU. Well done to the U.18 team who have reached the Leinster soccer final. The 4B Transition Year Film Studies Group will write, produce, direct and edit their own film with the Film Circle group this week. At the end of the week each student will receive a copy of the film on D.V.D. The school’s golf competition was won by Aoife Phillips with Megan Freeman in second place, Aisling Spillane in third and Alice Baneham in fourth. Well done to all. French & German Orals and Music and Home Economics Practicals for Junior & Leaving Certificate are on-going this week. Loreto Public Speaking tookplace this week. 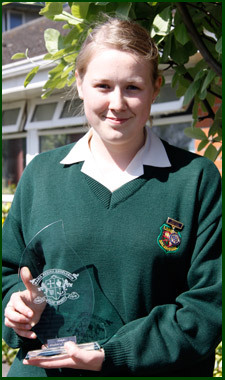 Congratulations to Kate Thompson, 2nd Year who won the Loreto Junior Public Speaking competition. Well done to Alexa Donnelly who competed at Senior Level and who admirably represented the school. 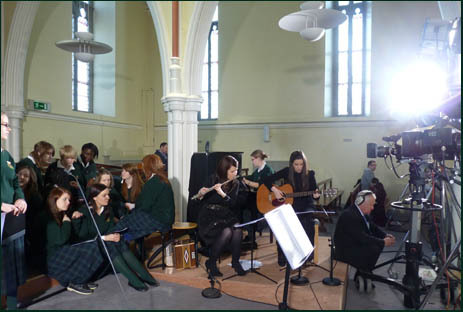 Congratulations to Ms. Mary McFadden, the Music teachers, the Religion teachers and all who participated in the wonderful televised Mass on Sunday, 11th April. Many thanks to all who have proffered their positive comments. Well done to Aoife Phillips and Rachel Taylor on being the net score winners at the Leinster Schoolgirls Golf Championships. Hard luck to the U.18 Gaelic team who were defeated in the All-Ireland semi-final by Strokestown. All the short throw Digital Projectors were installed over the Easter. We now await the 100 mb of broadband to go live. This has been a most successful project sponsored by the Department of Energy and Communications. The Transition Year Film Studies Group will write, produce, direct and edit their own film with the Film Circle group this week. At the end of the week each student will receive a copy of the film on D.V.D. This is History Week in the school with a wide range of activities – museum, quizzes, displays etc. Oral Irish, Home Economics and Music Practicals are on-going. Best wishes to all our students. Well done to TY students Emma Cooke, Ciara Dunne, Lauren Fagan, Eilish Ferguson, Grainnne Kane and Aisling McGloughlin who have made it through to the finals of the One Good Idea Project, sponsored by the Sustainable Energy Authority of Ireland, to be held on May 6th in Dublin Castle. 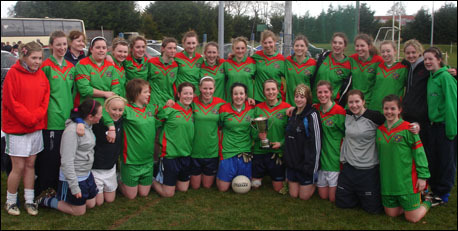 Congratulations to the Under 18 Gaelic team who won the Leinster Championship against Scoil Mhuire, Trim. Woman of the match was Grainne Barrett. The team will play the All Ireland semi-final against Strokestown on Monday, 29th March. Congratulations to the Under 14 Badminton team who were runners up in the All Ireland Championships. Well done to the T.Y. Basketball team on their match in Palmerstown. 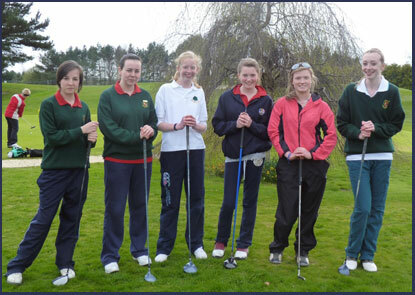 Students are also involved in the Leinster Schools Girls Golf Championship on Friday, 26th. 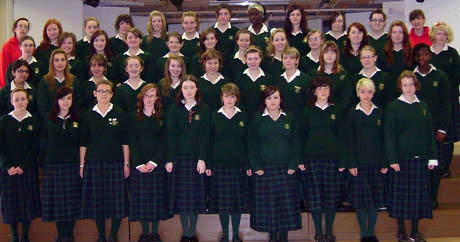 Members of the Senior Choir are participating in the Emmanuel Concert in the Helix on Thursday25th. The Senior Choir are also rehearsing for the televised Mass from Balbriggan Church on 10th April at 11.15. Well done to the Transition Years and their teachers on their wonderful production of “South Pacific”. Holocaust survivor Tomi Reichental spoke about his experience to Senior History classes on Thursday, 25th March. The school had a wonderful Intercultural Day on Friday, 26th March with all students, Irish and new Irish, celebrating their nationalities. Best wishes to the two groups on school tours over the Easter – the ski trip to Norway and the Second Year trip to France. Many thanks to all the teachers involved for organising their trips. Oral and Practicals for the Junior and Leaving Certificate will being on April 12th on students return to school. Best of Luck to all taking these examinations. The Transition Year Musical “South Pacific” will take place from 22nd to 26th March, excluding the 24th. Well done to the two teams representing the school at the Fingal Enterprise Awards in the Crown Plaza, Blanchardstown on Friday, 19th March. Well done to Roisin Leahy and Emma Cooke who have qualified for a number of German related events due to being in the top 100 nationally in their Junior Certificate. 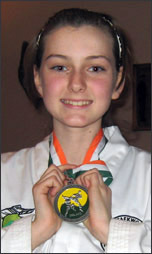 Last Saturday, Ellen Thorp 1E, won a silver medal at an International Taekwon-Do Competition in Tallaght. Ellen is a member of the Rush Taekwon-Do School. Best wishes to the U-18 Gaelic team playing Scoil Mhuire, Trim on Monday, 22nd March at 12.30. The school’s 100mbps Project is very well advanced. The Digital Throw Projectors are being installed and the Department of Energy and Communication intend having the broadband connection by mid April. Rehearsals for the Transition Year Musical “South Pacific” are at an advanced stage. The show will run between March 22nd and 26th excluding Wednesday, 24th. Well done to soccer, hockey and Gaelic teams this week on their successes and performances. Well done to the two teams who reached the finals of the Loreto Mace Debates on Wednesday. 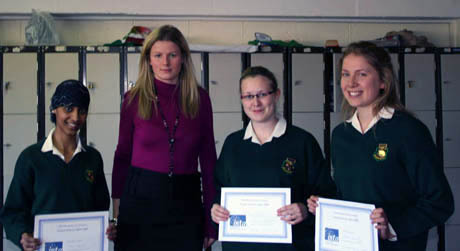 The girls were Michelle McCormack, Niamh Harford, Alexa Donnelly and Lindsey Pulsford. Second Year Retreats took place this week with the “Mustard Seed” group. Congratulations to the Junior Badminton team on winning the Leinster Division Two Championship. They are Jade Plunkett, Caroline Macken, Emer Harvey and Stephanie McCourt. An Assessment Test for incoming First Years took place on Friday, 26th February. The Transition Year Parent Teacher meeting will take place on Monday, 8th March, 1.30 to 4 p.m. Transition Year students are involved in “A Space for Learning” national design competition created by the Irish Architecture Foundation. (I.A.F.) We are one of 29 schools across Dublin who have teamed up with architecture practices as part of the competition. Architect and past pupil Aoife Banim is directing the Loreto girls. Well done to our YSI team who participated in the Regional heats of the Young Social Innovators annual SpeakOut event this week. A reunion of the class of 2000 will take place on Friday, June 4th in the Bracken Court Hotel at 8.30 pm. If you know any students from that year, please bring this event to their attention - we know they would be delighted to avail of the opportunity to catch up with old friends. Best wishes to Rachel Nevins who will be representing the school at the All Ireland Swimming Competition in Cork this weekend. Best wishes to the Under 16 Gaelic team playing in the Dublin Final. Transition Years complete their Work Experience placement on Friday, 12th February. Mock Examinations for Third & Sixth Year have begun and will continue into next week. Best wishes to Lyndsay Pulsford in the semi finals of the Soroptimist Public Speaking competition in Mullingar on the 6th February 2010. Well done to the school athletics team in the D.C.U. athletics event. Well done to the Badminton team on their performance during the week. Well done to Lyndsay Pulsford on reaching the Soroptimists Public Speaking Semi Final. 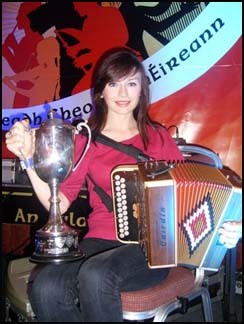 Well done also to Alexa Donnelly who participated in the competition. Mock Interviews for 5th Years continue this week. Well done to the hockey and football teams who played this week. The U.18 Gaelic team have reached the Dublin final. See below for details of Supervised Evening Study. The past week has been Mary Ward week, foundress of the Loreto Order. A wide variety of events occurred. The student council is currently undertaking a project to update and restock the school library and is asking for the help of parents and families from the school. A booklist has been compiled, and it would be really appreciated if you have any copies of the books lying around at home, that are no longer required, and wouldn't mind donating them to the school council. Evening study has resumed for all students from January to May 2010. It takes place Monday to Friday from 4.15 p.m. to 5.45 p.m., with the exception of Wednesday, when it is on from 3.30 p.m. to 5 p.m. This is once-off payment and covers each student for the team from January to May. The money should be paid to the teacher on duty during evening study. Transition Years are completing their mid-year examinations this week before going out on a three week work experience placement. The U.16 soccer team were narrowly defeated in the Leinster semi-final at Oriel Park, Dundalk. A major fund raising campaign in aid of the Haiti earthquake appeal will begin on Monday, 25th January. Next week is Mary Ward week – foundress of the Loreto Order. A number of events are organised. Best wishes to Lyndsay Pulsford and Alexa Donnelly in the first round of the Soroptimist Debate this weekend. Swine Flu vaccinations will take place on Monday, 25th Jan.
Well done to the T.Y. Debating team in the Debating Science Issues in D.C.U. 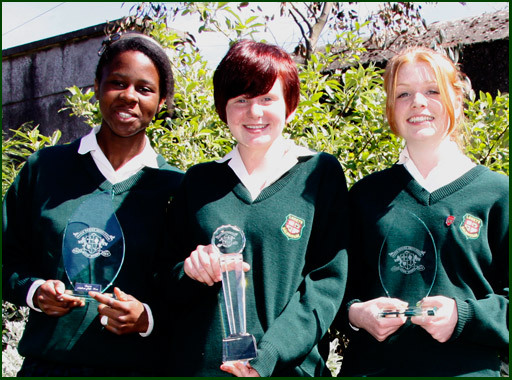 Significant dates for students intending to start in First Year in Loreto Balbriggan, September 2011. Information Packages will be forwarded to schools in Category A and B in the first week of March 2010. They are also available from the school office. Welcome back to all our students after the Christmas break. Best wishes for 2010. The Second Year Parent Teacher meeting and Staff meeting schedule for the 14th and 18th January respectively will be rescheduled. Fifth Years had a seminar on interview skills from Mr. Derek Quirke prior to the mock interviews. Well done to the Gaisce group on organising the Junior Talent Show. The winner was Lauren Walsh, 2nd Year. Mock Leaving Certificate & Junior Certificate Timetables have been given to the students. The school will open tomorrow, Tuesday, January 12th. The 2nd Year Parent Teacher Meeting scheduled for this Thursday, January 14th., is postponed. A new date will be given shortly. The school and school office will remain closed tomorrow, Friday, January 8th. School is closed tomorrow, Thursday, January 7th, due to weather. French Week was a great success with many and varied activities occurring. Transition Year had a talk on Eating Disorders. A wonderful Ceol Loreto Gig took place on Thursday, 17th December. Individuals in the line up were two finalists in the All Ireland Talent Show – Grace Dowling (as part of Tumbleweed) and Ciara McGuinness and Alison Doran’s comedy act. Well done to Hockey teams in their matches this week. The Transition Year Photography Group were part of the “Ways of Seeing” exhibition in the Chapel at Swords Castle. This Photography Exhibition was sponsored by Fingal Co. Council. Next week the school will have its annual Carol Service in Balbriggan Parish Church. School will close on Tuesday. I am writing to inform you of our Christmas arrangements and some changed times in relation to Parent Teacher and Staff Meetings. These changes to Parent/Teacher and Staff meetings are as a result of an A.S.T.I directive. Monday, December 21st:School Carol Service in the Parish Church at 12 approx. Thursday, January 14th:	2nd Year Parent/Teacher Meeting 1.30 – 4p.m. Monday, January 18th: Staff meeting, 2 – 4 p.m.
Class finishes at 1.10 p.m.
Monday, March 8th:	4th Year Parent/Teacher meeting, 2 – 4 p.m.
Wednesday, April 14th:	Staff meeting, 1.20 – 3.20 p.m.
Class finishes at 12.25 a.m. I would take this opportunity to wish you a happy Christmas and New Year. Congratulations to the Transition Years on their wonderful Fashion Show. The theme of the show was “A Midsummer Night’s Dream” and focused on a range of clothes from such clothes stores such as Vera Moda, Fuse, Zara, Bay, Echo, Intirigue, Dunnes, Balbriggan Bridal and Benneton. A further highlight was the hats and costumes designed by the students themselves. Particular congratulations to the teachers involved, Ms. Lennon, Ms. Briscoe and Ms. Brennan. Well done to hockey, badminton and soccer teams on their matches this week. Well done to soccer, badminton and hockey teams on their matches. Science week was a great success with a wide variety of events. Congratulations to sixth year students Laila Bashir, Éadaoin Copeland and Orna Donnelly for finishing in third place in the ISTA science quiz, held on Thursday evening in Trinity College. The girls are pictured below with Ms. Louise Conroy. 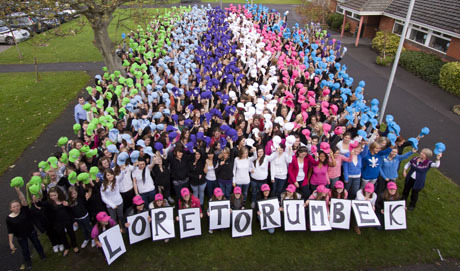 The entire school is having a major non-uniform/baseball cap fund raiser for our sister school, Loreto Rumbek, South Sudan. Well done to the 5th Years, Ms. Corrigan and Ms. McHugh for organizing it. This is Loreto Balbriggan Literary Week. There are a variety of events such as Public Speaking, Spelling Bee and a trip to the Patrick Kavanagh Centre. Well done to the hockey, basketball, badminton and soccer teams on their matches this week. The Sixth Years are involved in a week of Directed Prayer. The girls have, over the years, found this process most helpful. Student Council Elections took place this week. Best wishes to the German students on their trip to Berlin this weekend. A wonderful night’s entertainment was provided to a packed audience at the Ceol Loreto Gig on Tuesday, 20th. The school is delighted to be part of the pilot 100 mb broadband which is to be rolled out in the coming months. Well done to the following students who have been given major roles in the TY musical, South Pacific, following auditions: Sarah Ferguson, Emma Cooke, Kate Bauer, Karima Bouzzah, Samantha Kizunga, Roisin Stanley, Carys Cooke, Anna O’Keefe, Rachel McCarthy. Congratulations to the Senior Choir on reaching the regional final in Sligo of the Co-Operation Ireland Choir Competition. Ms. McFadden and the Choir will travel to Sligo next Friday, 23rd October to participate. A wide range of activities have been organized to mark Maths week. Senior Business students are on a Business trip to Paris this weekend. They will visit a number of business related locations including Peugeot and State Francaise. The Senior Basketball team took part in a series of matches in the National Arena, Tallaght. Three students, Rory Ann Sweeney, Hannah Scott and Suzanne Gunbay, attended the Loreto organized Justice, Peace and Integrity of Creation in the Emmaus Retreat Centre. The school had a most successful Maths Inspection on the week beginning the 28th September. The Parents Association AGM proved most popular. Shane Martin gave an talk on “Parenting Teenagers”. The Random Selection Process for Category B & Category C students took place on Tuesday, 29th September. The two students who visited Kenya as part of the Loreto visit, Grainne Rice and Cait Baxter have given a number of talks to classes. Congratulations to the U.14 team on winning the Leinster Final, 1 – 0 against Eureka, Kells. The final had been held over from last year. The captain of the team is Ciara Harris and the goal scorer was Velyn Igbosnu. 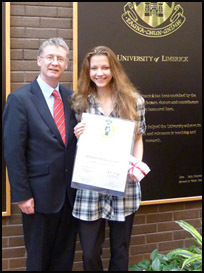 Gerda Ziemele was awarded a J.P. MacManus Scholarship, based on her excellent Leaving Certificate results, at the University of Limerick. Congratulations to our first ever sailing team who came 14th out of 41 teams in the All Ireland Inter Schools Sailing Championship. The members of the team were Clara Hynes, Aisling Duff, Lisa Coleman and Sinead Boylan. Congratulations to the two tennis teams who participated in the Drogheda Tennis Tourament. The team of Ailbhe McDonagh Kelly, Maebh Moloney, Ciara Dunne, Jillian Smith, Megan Freeman, Aoife Dunne, Rachel Taylor and Sarah Murphy won the competition. Fifth Year Art students visited the Irish Museum of Modern Art. 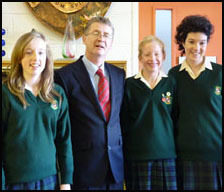 Registration for students beginning in Loreto in September 2010 took place on Wednesday, 23rd September. Fifth & Sixth Year students attended the Higher Options Conference on Wednesday, 16th. Registration for places will take place on Wednesday, 23rd September. Congratulations to our outgoing Sixth Years on their superb Leaving Certificate results. A large number of Transition Years are in Killary Adventure Centre this week. Class as normal for the remainder of Transition Year. The mass to open the school year took place in the parish church on Thursday, 10th September. Grainne Rice and Cait Baxter visited Kenya this summer as part of a Loreto Justice and Peace Programme. We are delighted to be welcome all our new students and staff for the upcoming academic year. The Admission Policy will continue to be under constant review and a major review will occur in 2012, taking into account all factors, including the school’s characteristic spirit”. Consequently, students from the above schools will be in the first tranche of students accepted into the school.